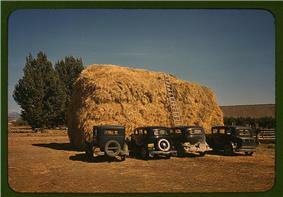 Hay stack and automobiles of peach pickers, Delta County, 1940. Delta County is one of the 64 counties of the U.S. state of Colorado. As of the 2010 census, the population was 30,952. The county seat is Delta. 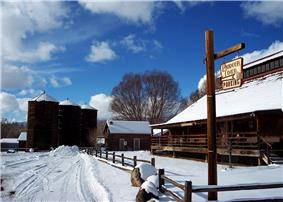 Delta County was created by the Colorado legislature on February 11, 1883, out of portions of central Gunnison County. The county was named from a delta of arable land at the mouth of the Uncompahgre River, where it flows into the Gunnison River. According to the U.S. Census Bureau, the county has a total area of 1,149 square miles (2,980 km2), of which 1,142 square miles (2,960 km2) is land and 6.5 square miles (17 km2) (0.6%) is water. As of the census of 2000, there were 27,834 people, 11,058 households, and 7,939 families residing in the county. The population density was 24 people per square mile (9/km²). There were 12,374 housing units at an average density of 11 per square mile (4/km²). The racial makeup of the county was 92.29% White, 0.52% Black or African American, 0.76% Native American, 0.32% Asian, 0.03% Pacific Islander, 4.25% from other races, and 1.83% from two or more races. 11.39% of the population were Hispanic or Latino of any race. There were 11,058 households out of which 29.00% had children under the age of 18 living with them, 60.30% were married couples living together, 7.90% had a female householder with no husband present, and 28.20% were non-families. 24.80% of all households were made up of individuals and 12.40% had someone living alone who was 65 years of age or older. The average household size was 2.43 and the average family size was 2.89. In the county the population was spread out with 24.00% under the age of 18, 6.30% from 18 to 24, 23.60% from 25 to 44, 26.50% from 45 to 64, and 19.70% who were 65 years of age or older. The median age was 42 years. For every 100 females there were 100.80 males. For every 100 females age 18 and over, there were 98.60 males. The median income for a household in the county was $32,785, and the median income for a family was $37,748. Males had a median income of $31,348 versus $19,916 for females. The per capita income for the county was $17,152. About 8.50% of families and 12.10% of the population were below the poverty line, including 15.00% of those under age 18 and 9.60% of those age 65 or over. The local papers are the Delta County Independent and the Mountain Valley News.